Jack Butala: Jack Butala here with Land Academy. Before we get started with our interview with Luke Smith, which was recorded about a month and a half ago, I have to share with you that he has been incredibly successful at purchasing and selling real estate, so please keep that in mind while you’re listening, and if you need more details than that, join us at successplan.com, which is our online membership community. Thanks. Luke Smith retired from being a penny stock broker at 33 and is now a full-time dad of two toddlers from Encinitas California. He heard about Land Academy on biggerpockets.com. He has not completed a purchase from his mailers yet, but he got a huge response and he’s using that to learn from and he’s sending out higher targeted mailers. It sounds like Luke, that we’re catching you right before massive success. Luke Smith: I hope so. Jack Butala: Tell us … You sent the mailer out. Give us a little bit of some of the details and some of the types of calls that you got back, and the response that you got. Luke Smith: Sure, I’d love to. I was too cheap to pay for your program at first. I thought I’d give it a try with all the free information, and just reading between the lines, I thought I’d give it a try. I fired off a couple hundred mailers and people started calling. Luke Smith: I think where I was off base, was I was going off the appraised values and doing like a smaller piece of the appraised values. I was thinking I should sell these properties for a couple thousand bucks or more, so I’ll go for a couple thousand dollars or more appraised values, and the people that are calling back think their properties are worth $50,000, or $100,000. I’m offering like $400 or a couple hundred dollars, but I was amazed at how many actually called back. They read their mail, they stewed on this thing. They got pissed off at my low-ball offer. They really value their land, and they called me back and they wanted to chew me out, or haggle on price. To me, that’s success. My numbers were wrong. I can fix that in the next ones, but those are potential buyers of land. Those are people who buy vacant land in the middle of nowhere that I was making offers on. They have astronomical numbers that they value that land at. Jack Butala: Well you’re exactly right. They are on your buyer list now, I hope. Jack Butala: All right, so I’m going to ask you a few questions. Jill DeWit: I have to interject one thing though. Oh, go ahead. Jill DeWit: I just want to say, when you have these people though, I feel like a broken record, but $10,000, they think it’s worth $10,000, three, six months from now, your $500 offer is not so bad. You know? Sometimes they do overvalue. It’s a priceless asset to them and I get it. It was handed down to the family, whatever, but then they realize, “Gosh, nobody really does want this and this guy wanted to give me something”, and then they do a little homework and they realize you’re not that far off. Jill DeWit: It can happen still, so that’s good. Jack Butala: Did you, Luke, the offers that you sent out, did you send an offer out that was modeled after the ones that we always send out? Was it an actual offer? Luke Smith: It was an actual offer, two page offer with a dollar amount in there, and I put a reply envelope and I was amazed at how many people sent back notes and comments and things on the offer in the reply envelope with no postage on it, and the post office still delivered it. Luke Smith: Because it had my name and address in both to and from, so I wonder how many got lost in the mail. I just went off of your free information to give it a try, and then I believed in it so much after that, I bought your program and I believe I’ve gotten a lot more accurate by watching all your DVDs and going through the details from there. We’ll see how this next mailing comes through. 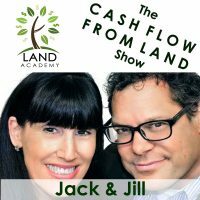 Jack Butala: Jill, this is another podcast guest that we probably should have paid. Jack Butala: We should have paid him to be on the show. You can’t rehearse this kind of stuff. Luke Smith: I’m just skeptical. You have a lot of good stuff to say, and so I didn’t really want to pay for it right out of the bat, I want to test it first. It was cheaper to test it and believe in it more and then pay. That’s what I did. Jack Butala: Yeah. That’s exactly what I’m hearing. Do you remember the raw number Luke? Like how many you sent out, what kind of responses you got, the percentages. Luke Smith: I sent out … I was printing them off of my printer, which is really slow and stuffing them myself, and so I could do about 100 a day, like doing the mail merge and putting it together. I was also testing different counties. I did 100 a day, and I directed them at tax delinquent people only, and I sent out over 400 of them. It wasn’t exactly 100 a day, 120 or something. I think I got more than 20 callers off of each one of those counties. Some counties more, so I think it’s very specific on which county I was doing it to. One particular county, I probably got 30, to maybe 40 callers from the hundred mailers. Jack Butala: So you got about 20% return, ballpark? Jack Butala: That is absolutely amazing. Luke Smith: I can’t believe that many people read the mail. I’m an internet guy. I like electronic signature, and email, and that kind of stuff, not sending stuff through the old fashioned mailbox. When people get stuff in the mail and they read it. Jack Butala: Yeah. It doesn’t get lost in the sea of junk email. Jack Butala: That’s great. You know, Jill and I have not done a tax-specific mailer in quite some time. We kind of stick to the ones where, well we stick to the ones that we talk about in our program, in our education materials, and our return percentage is a little bit lower, but Jill can convert them pretty well. When they do call back, it works pretty well, works very well. We’re closer to 5%. Luke Smith: It’s probably easier to scale up the sending a mailer to everybody instead of just the tax delinquent people. You could do it on bigger size. Jack Butala: Did anybody sign the offer and just send it back? Luke Smith: No. No one signed it and sent it back. Jack Butala: Not yet though. Luke Smith: Not yet. Exactly. Jack Butala: Boy, that’s great news. Where do you want to go with all this? Luke Smith: I’d like to have the other problem. I’ve got so many properties in my hand, I don’t know how to sell them all, and that’s where I want to go right now, but eventually scaling that business up and see how big I can scale it up to. Have someone else answer the phone and close the deals, automate the thing eventually. Just pick which markets I should be targeting, doing the strategic planning of this market, this size property, or this specific criteria, do you we want to make offers on to put the capital into right now. Those kinds of decisions, but boil the business down to just that, but to be able to do that, I want to learn all the aspects of the business and do all the jobs myself first. Jack Butala: How far are you in the education program, in our program? Luke Smith: I went through all your DVDs and I’ve looked through most all the data, data discs, looking at forms, and maps, and everything. Jack Butala: All right, so I want to ask you a couple of questions, like what is the worst job you’ve ever had? Jack Butala: Oh my gosh. It’s Michigan day. Jill DeWit: Yay. Wait, wait, wait, wait, but he’s in California now everyone. Yay. Jack Butala: This is the fourth show we’ve done today, and every single person on the show is from Michigan. Luke Smith: There you go. Jack Butala: Where in Michigan are you from? Luke Smith: We summered and vacationed and everything close to Traverse City, and northern Michigan, northern, lower Michigan, it’s a very vacation town for people that don’t know it. One of the things that tourists do when they go there is they buy fudge, Doug Murdick’s fudge. It’s like the renowned fudge store, and so I got a job. It was probably my first job, in one of his shops right on the side of town, and we used to make and sell fudge. It was quite the mundane job talking to tourists all the time, but because it was right on the side of town, people would stop there and ask for directions. Probably more people asked for directions than stopped there to buy fudge, so we used to have fun with it, giving them all kinds of directions. I was the only guy working there. It was all good-looking younger girls, and they had set up these perfect spreadsheets, drawn up by hand of directions how many lights, right turns and left turns there to get to pretty much everything around the area, so you could go by their directions, but who’s going to do that right? When you get asked like 100 times a day, and so the other tourist destination in Northern Michigan that everyone’s looking for is Mackinac Island, and how far to Mackinac Island and how do you get there? There’s a Mackinac bridge. It’s a big bridge that connects lower Michigan and northern Michigan, so we would tell them, “Go to the bridge and wait at the base of the bridge until the bridge turns over to the island and then you can drive across the bridge to the island”, and get more detailed in the story about it. We used to do that all day and not think anything of it and people would never come back. They can’t find you again when they’re lost, but there was a story that came up in the newspaper about people stopping by the bridge and other people had heard this story, so some of the gas stations were telling the same story, and it became like a local joke about people that would stop at the bridge and wait for it to turn over to the island so they could get to the island. We used to have fun with it. It was a completely boring, useless job. Luke Smith: The only thing I really learned was how to count back change. Jack Butala: I think when you’re dealing with the public, like a customer service job like that, in person, that ranks pretty high on my list of the worst jobs you can have too. Jack Butala: Jill, you had a job like that didn’t you? Jill DeWit: It’s funny because I used to work years ago at the Little Rocky Mountain Chocolate Factory in Laguna Beach. Similar kind of job, but they’ve arrived there, there was really nowhere to go for directions. Right there at main beach, it was really fun. We had a good time. That’s good. Jack Butala: My sister lives in Traverse City. She’s lived there since the early 90s. She loves it, she wouldn’t live anywhere else. Luke Smith: It’s beautiful for two, maybe three months a year. Luke Smith: The rest of the time it’s just arctic. Jack Butala: Yeah, that’s why we live here. 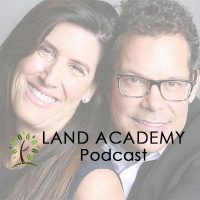 Jack Butala: What was your primary motivation to get involved with Land Academy? Luke Smith: It just resonates with me. The simplicity. I’m a landlord of properties and there’s all kinds of problems and things. Over time, they pay great yields, just rental properties that I have, but I buy the things with no insurance because I don’t like to deal with the insurance. You know? I’m just insuring myself. I don’t like to use the banks. I paid cash for them all, and just try to cut out a lot of the middle men as much as I can, and it just makes pretty much simpler business. The land business is already set up that way. That’s normal. That’s the way it’s done. The bankers and a lot of the other middle men don’t even bother. They don’t want to be involved in it. To me, that’s great. There’s margins there because those people don’t service and market that business, there’s little competition, it’s a contrary in play. Jack Butala: Why do you think that is? Why do you think that so few lenders will lend on rural vacant property, and so … You’re exactly right, by the way, and that was one of the reasons that I chose this little niche in real estate a lot of years ago, because everybody doesn’t, there’s so few people that get involved, and I still don’t understand that. Do you have any thoughts on that? Luke Smith: Yeah, it’s a good question. It’s just, I don’t think they can get over the concept of the land [inaudible 00:14:00] pay rent. It’s like Wall Street doesn’t like gold because gold doesn’t pay interest. Luke Smith: Or silver, or other commodities. They don’t pay interest. They don’t want to be in that business, they want to be in the interest collecting business. Jack Butala: Great analogy actually. You’re right. Wall Street doesn’t like precious metals. What’s been the best part of your experience so far? Luke Smith: Seeing my phone blow up from making those offers. I think that’s spectacular. I just have to make better offers, more targeted offers that are on properties that are more attainable for the prices I’m offering, and close that gap. Turn down the pissed off callers and I think you’ve got an awesome business there.